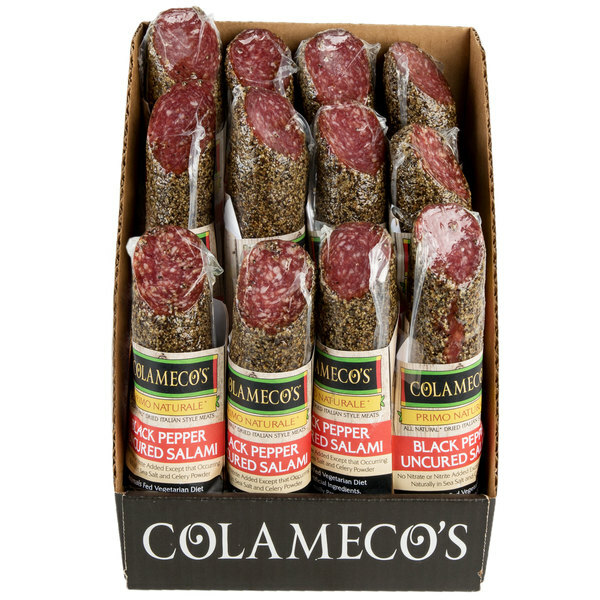 This Colameco's Primo Naturale black pepper uncured salami delivers an irresistible, well-balanced flavor profile that will leave any customer wanting more! This marbled, all natural meat is packed with a unique blend of Italian style seasonings to produce an unmistakable sweet and savory flavor, with notes of garlic and pepper accentuated by organic wine. It is then coated in coarsely ground black pepper to add texture and depth of flavor with a slight kick that will delight your patrons' taste buds. Showcase in your deli for customers to purchase for their own home use, or create a meat, cheese, and fruit snack box that is a perfect light, yet satisfying solution for your on-the-go customers. When creating a memorable charcuterie board, incorporate with goat cheese or burrata, grilled crostini, kalamata olives, and figs, complemented by your guests' wine of choice. 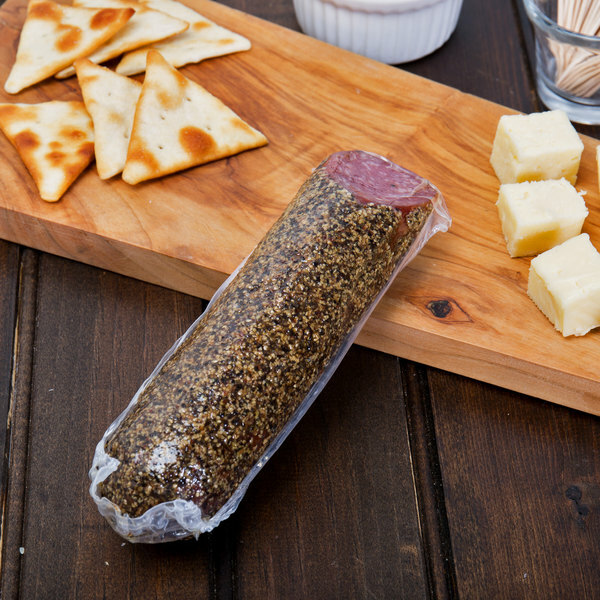 This all natural salami is made with 100% pork that was raised without the use of antibiotics on a vegetarian diet. Each salame is hand crafted, hand turned, and air-dried in old world drying rooms to ensure great tasting products of artisanal quality. Uncured meats are simply preserved using natural salts and flavoring agents, instead of chemicals and additives like nitrate or nitrite. 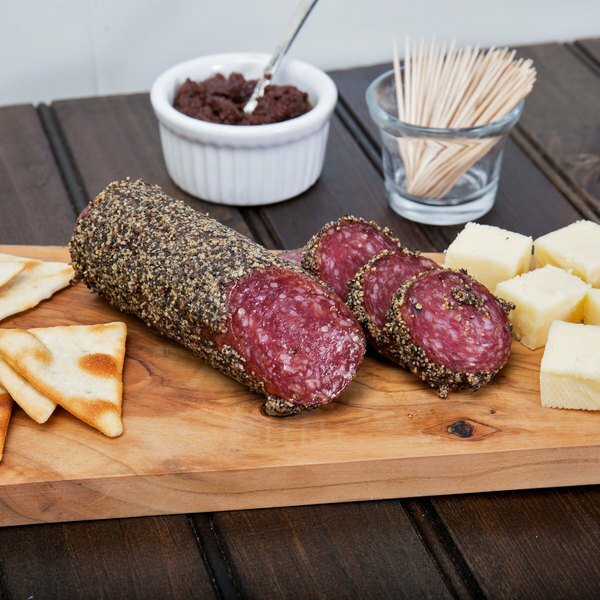 This salami is dried using sea salt and celery powder, and contains no artificial ingredients for a minimally processed, high quality product you can feel good about serving. Coming in (12) 7 oz. individually-wrapped chubs, you are sure to be in good supply for your establishment's needs. Wellshire began in 1996 when founder, Louis B. Colameco III, wanted to end the concern that his children were eating over processed meats, packed with chemicals that provided no health benefits or nutritional value. Guided by the belief that less is more when it comes to food, Wellshire is proud to guarantee that none of its meat products include preservatives, antibiotics, or growth hormones ever, and all of their animals are raised humanely in stress-free environments, which ultimately results in better tasting food! 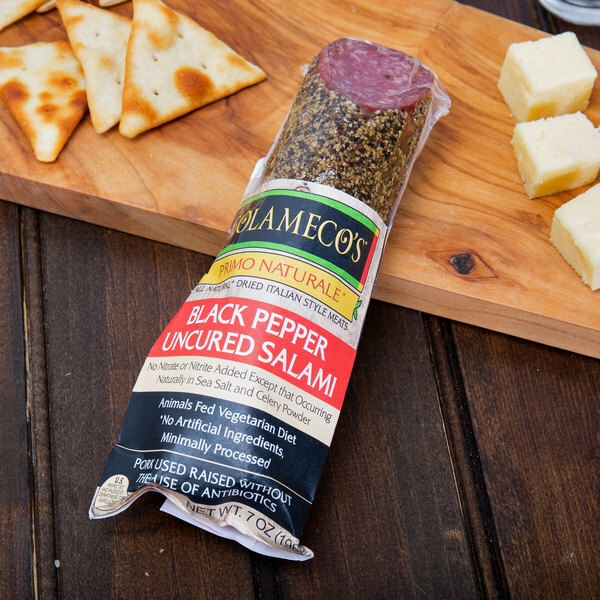 Colameco's Primo Naturale is their brand of dried products that are perfectly seasoned and full of sophisticated flavor. Wellshire is committed to going above and beyond industry standards to produce high quality meats, making their products an option you can always trust.